Consummate pop-up master Robert Sabuda offers an elegant ode to possibility that will inspire anyone setting off on a new life chapter. All of life’s possibilities are just a page turn away in this beautiful pop-up book from renowned paper artist Robert Sabuda. Throughout, phrases and images evoking potential (an acorn, an egg, a paper airplane) are answered by a glorious 3-D image on the following spread (a towering tree, a flock of birds, a rocket soaring upward). 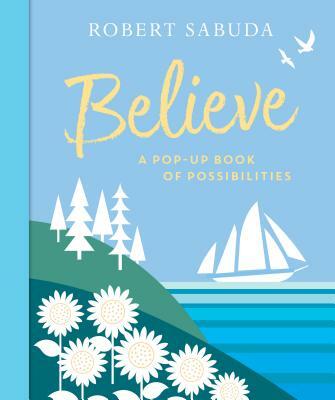 An ideal gift for graduates from kindergarten to college and beyond, Believe is the perfect way to celebrate life’s passages and look forward to new horizons. Robert Sabuda is internationally acclaimed for his stunning pop-up books, including Ten Horse Farm, The Christmas Story, and the best-selling Encyclopedia Prehistorica and Encyclopedia Mythologica series, created with Matthew Reinhart. Robert Sabuda lives in New York City. A pop-up invitation to dream big...It's easy to imagine this giving Oh, the Places You'll Go a run for its money as a perennial graduation gift. An elevated outing, perhaps a touch vague but, as ever, magnificently designed.